I confess that my first introduction to the wonderful fictional detective Spenser was not via Robert B. Parker’s books, but through the television show, Spenser: For Hire. which I watched when I was – well, I’m not sure how young I was – definitely before I ever even considered purchasing anti wrinkle eye cream. By the time I was a sophomore in high school, however, Spenser and I had been more properly introduced, and I was hooked on Parker’s words and images, plots and characters. I’ve always loved mysteries and thrillers, and the Spenser novels were a nice bridge between the cozies I began with and the analyticals I also enjoy. They’re a wonderful mix of poetic rhythms and gritty reality – and their popularity is a testament to the man who wrote them. A series of novels, isn’t a bad legacy, as things go. 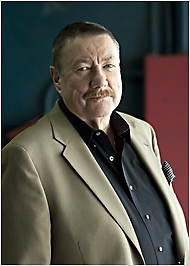 I don’t have the kind of reader’s connection with Mr. Parker that I had with Madeleine L’Engle or Douglas Adams, but I mourn the loss of Robert B. Parker, nevertheless.